We used data and science to identify the most dangerous cities in the Green Mountain State for 2019. This article is an opinion based on facts and is meant as infotainment. It is our fifth time ranking the most dangerous places to live in Vermont and is updated for 2019. Do you live in one of the most dangerous cities in Vermont? We all watch the news and see the Facebook feeds come across of the latest crimes that are happening in our home towns. While a major crime just blocks away from your house can make you feel really uneasy, in the big picture, most likely, where you live is relatively safe. On the whole, Vermont’s a pretty safe place to chill, ski, snowboard, and drink maple syrup by the gallon. I mean how much crime can there be in a state that’s 75% forests? Not much, but that doesn’t mean that some cities have a heckuva lot more crime than others. Instead of relying on speculation, we dug into the FBI crime data in order to identify the most dangerous places in Vermont. 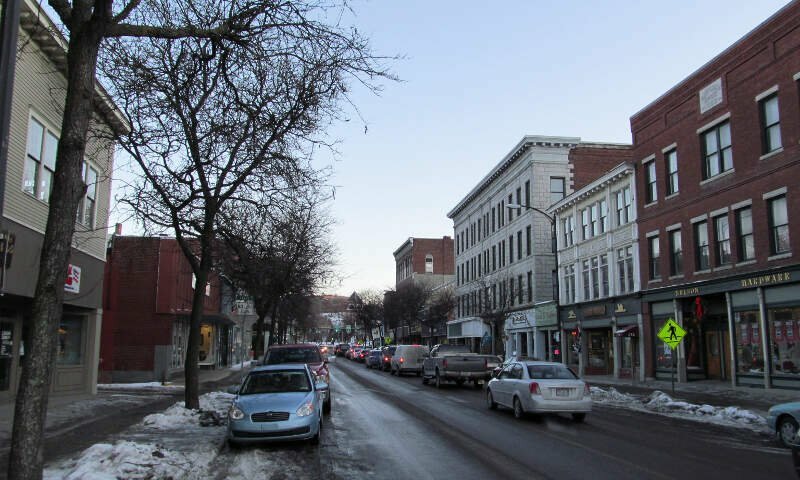 So what is the most dangerous city in Vermont? 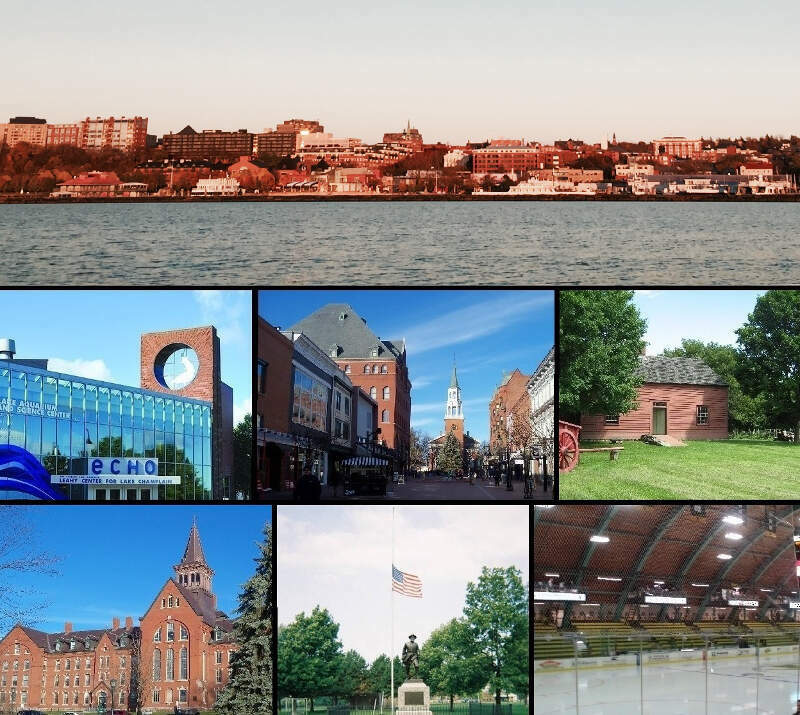 After analyzing 22 cities in Vermont, St. Albans takes the top spot as the most dangerous city in Vermont based on the most recent FBI data. Or learn more about the safest places in Vermont. 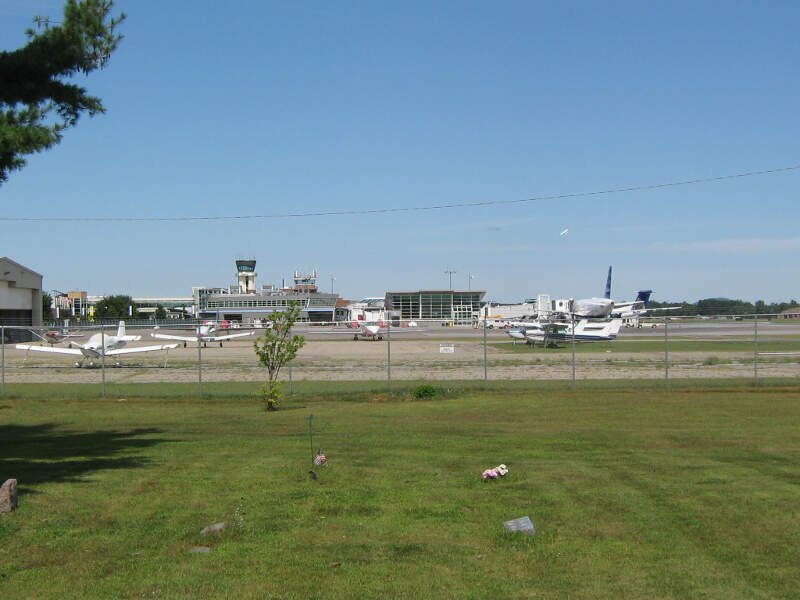 St. Albans has experienced an unfortunate boom in its crime rate recently. Between 2015-17, violent crime and property crime increased. That left residents of St. Albans with a 1 in 13.4 chance of being the victim of a property crime and a 1 in 147 chance of being the victim of violence in 2017. Crime in Barre has been heading in the right direction over the past few years, as both property and violent crimes have been on the decrease . Barre residents have a 1 in 21.4 chance of being the victim of a property crime, good for 2nd worst in the state. Additionally, they have a 1 in 279 chance of being the victim of a violent crime, 3rd worst in Vermont. It’s probably no surprise for most Vermonter’s to see Rutland taking 3rd place for most dangerous city in the state. Rutland experienced a 7% rise in violent crime between 2015-17, tempered by a 7% drop in property crime, meaning that, overall, crime has stayed at about the highest levels in the state. In 2017, folks in Rutland had a 1 in 181 chance of being murdered, raped, or assaulted, and a 1 in 30.3 chance of being robbed or the victim of arson. 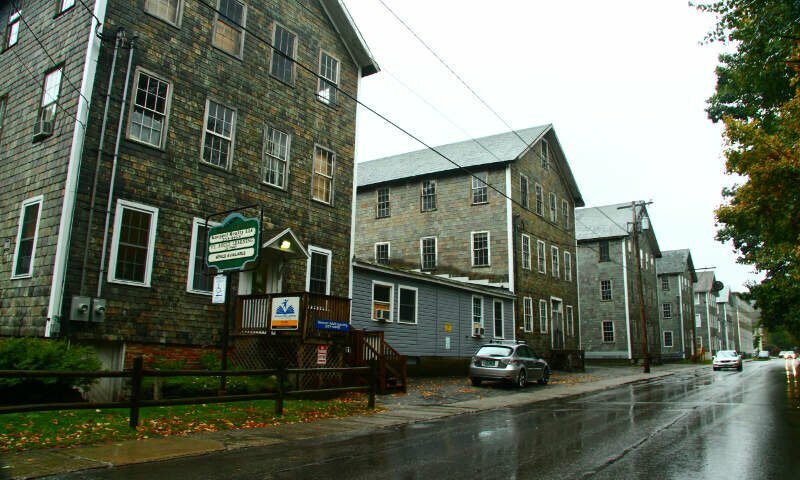 Located in southeastern Vermont, Brattleboro is Vermont’s 7th biggest town and 4th most dangerous. In recent years, the crime rate has changed dramatically in Brattleboro, for better and for worse. On the one hand, instances of violent crime dropped between 2015-17, but on the other, a hike in property crime during this interval leaves Brattleboro as the town with the 3rd highest rate of property crime in Vermont. Burlington is the 5th most violent city in Vermont. Unfortunately, Burlington has experienced a quick and steady rise in its crime in recent years, with both violent and property crime increasing between 2015-17. In 2017, residents of Burlington had a 1 in 319 chance of being the victim of violence. 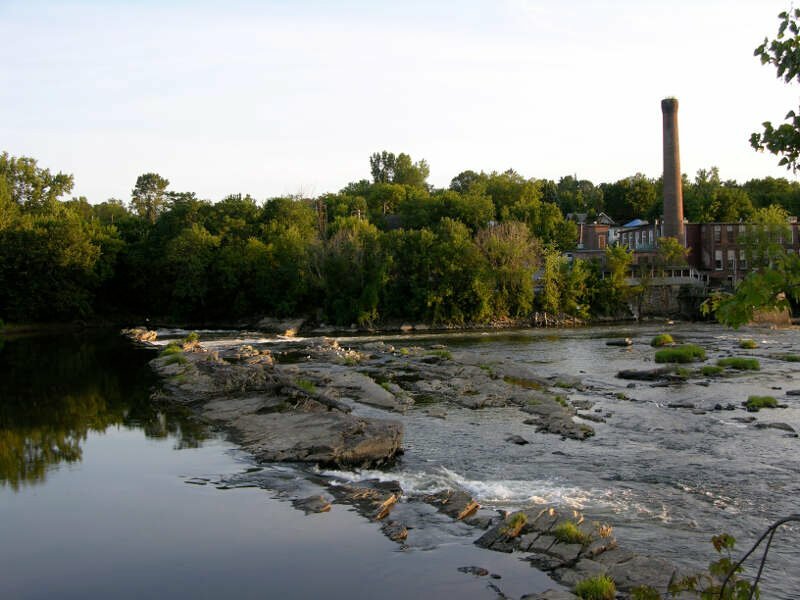 Winooski coming in as the 6th most dangerous place in Vermont might surprise some. But this fact may explain the mind-bogglingly high 1 in 37.8 chance residents faced of being the victim of a property crime in 2017 and the 1 in 284 chance of being the victim of violence. South Burlington, located in Chittenden County, is the 7th most dangerous and 11th most violent city in Vermont. Just 40 miles north of Brattleboro, Springfield has the 8th highest rate of violent crime, giving it a 8th place danger ranking overall. Folks in Springfield had a 1 in 449 chance of being the victim of a violent crime in 2017, a 5% increase from 2016. Property crime went up during this interval, giving a Springfield resident a 1 in 52.6 chance of being the victim of theft or arson in 2017. 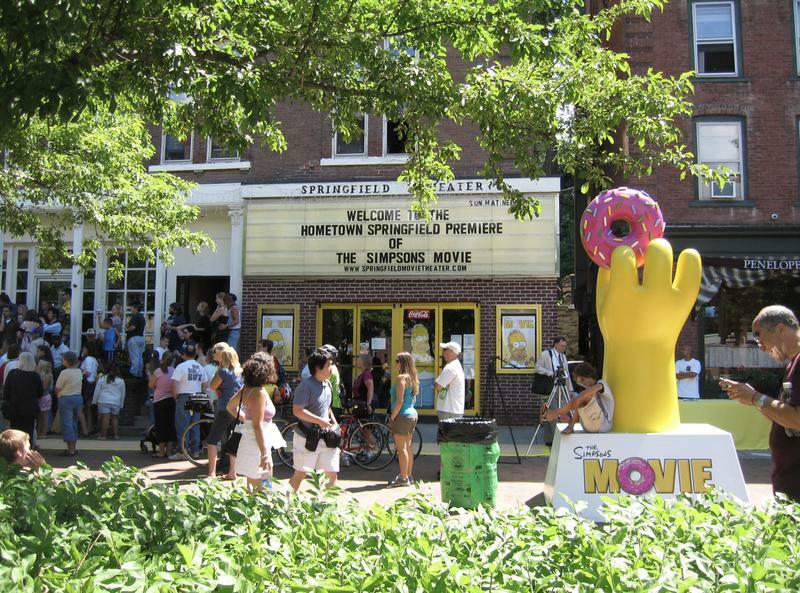 Montpelier residents faced a 1 in 467 chance of being the victim of violence in 2017 and a 1 in 43.0 chance of being the victim of a property crime — both statistics that have barely changed in recent years. It’s the 10th most violent city. 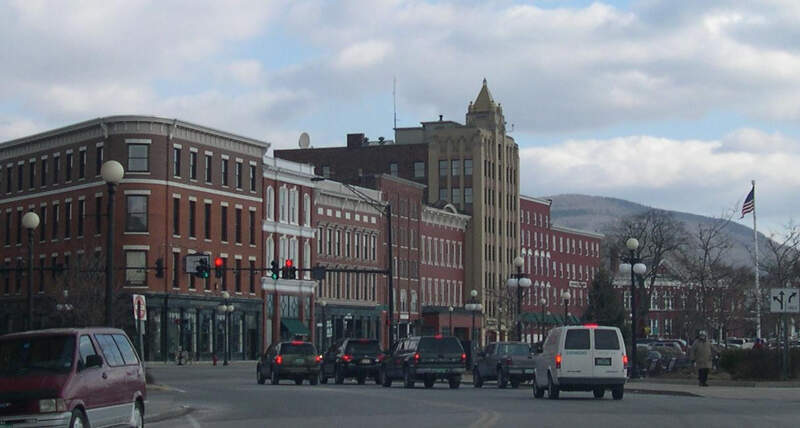 St. Johnsbury was named the best small town by National Geographic in 2006, but a recent surge in crime may change the some observers’ perspectives. Violent crime more than doubled between 2015-17, and property crime went up by 35%. 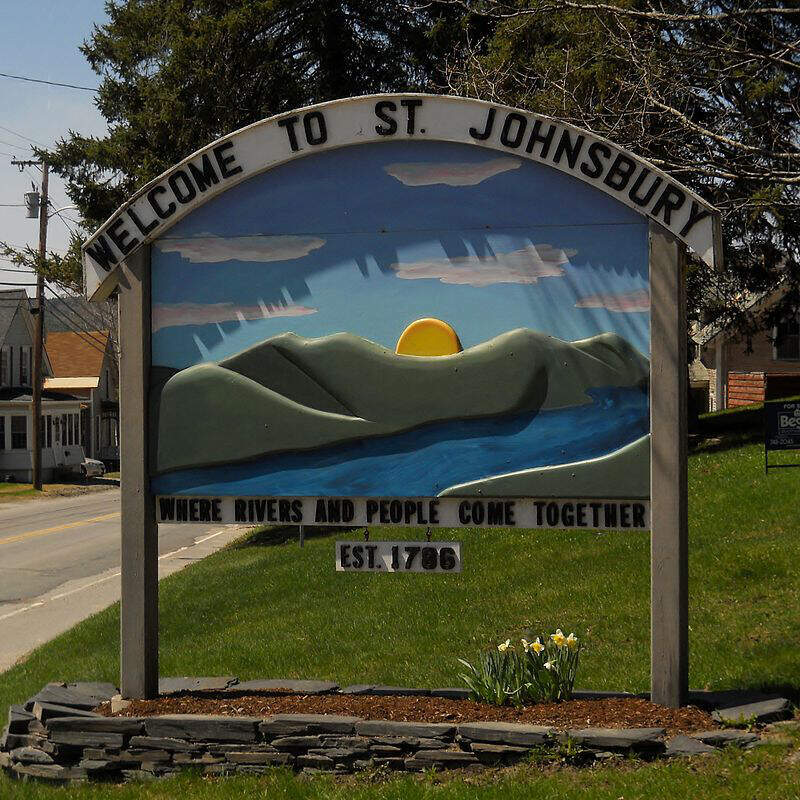 That means residents of St. Johnsbury had a 1 in 449 chance of being the victim of a violent crime and a 1 in 53.3 chance of being the victim of a property crime. 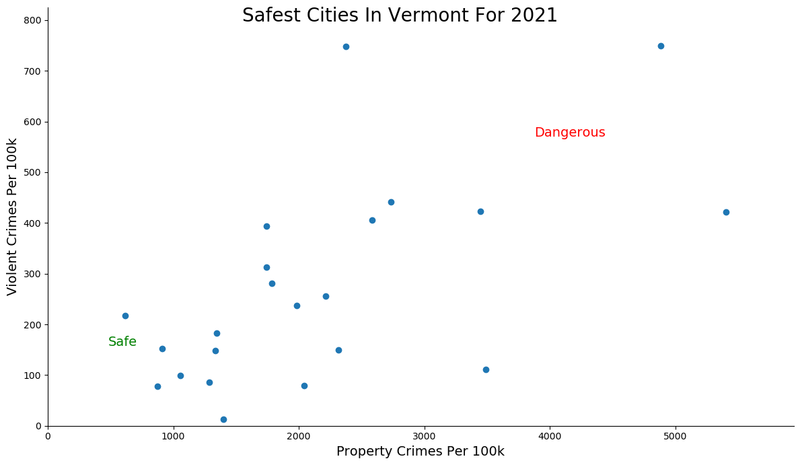 How we determined the most dangerous cities in Vermont for 2019? In order to make the analysis as apples to apples as possible, we only considered cities over 5,000 in population. That left us with 22 cities in Vermont. We then ranked each city from 1 to 22 for the two criteria with a #1 ranking being the most dangerous for the particular criteria. Finally, we ranked every city on the “Dangerous Index” with the lowest index being the most dangerous in Vermont — St. Albans. Read on for a detailed look at the 10 most dangerous cities in Vermont. 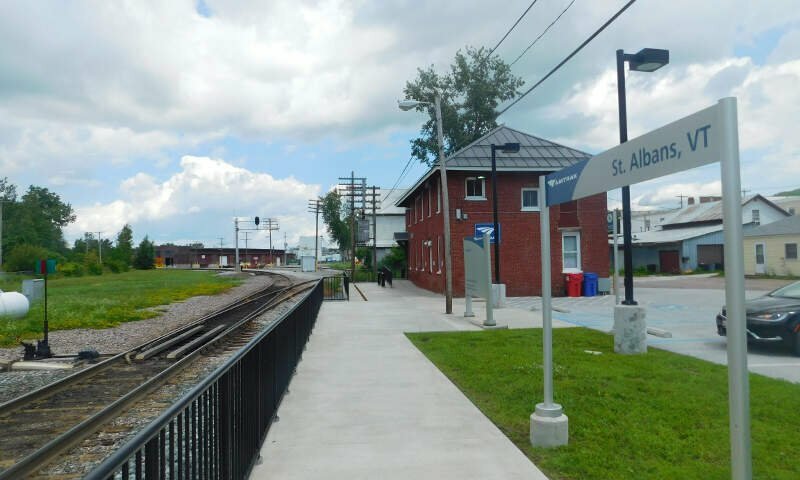 The latest FBI crime data shows that St. Albans ranks as the most dangerous city in Vermont for 2019. We want to point out again that there’s still safes places in St. Albans and that this isn’t a comment on the people that live there. So please don’t beat us up. Where Are The Most Dangerous Cities In Vermont? But I was it on Facebook and the internet ship it has to be true! steph, go back to your french model, u r comment has indications of the possibility that you may be an idiot. BTW, when u compile your own statistics the counter these which probably paint Vermont too pretty, go ahead and post them on here until then you should keep your stupid comments to yourself. 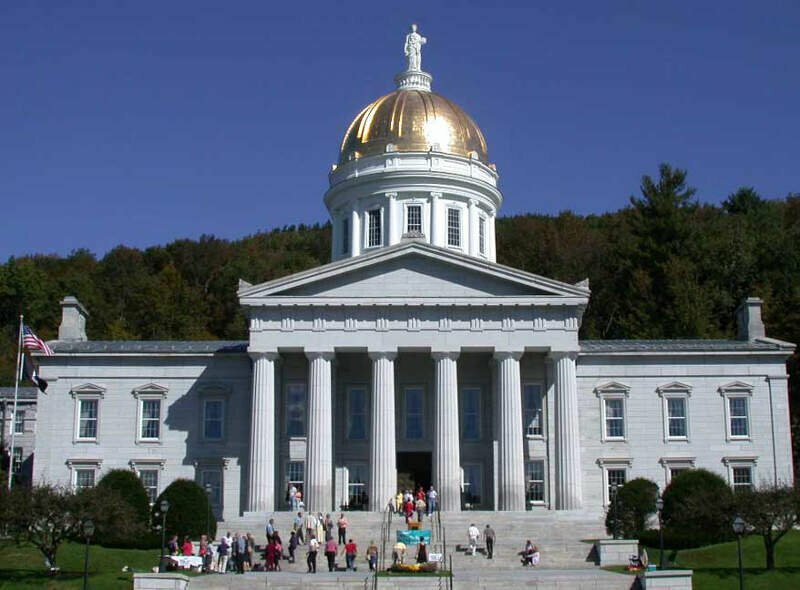 Vermont according to the FBI crime index report is seeing a surge of property crime. Also Stephanie is correct on the heroine stat. Glad to see any counterpoint to her claim went unsubstantiated Ala insults.